Deborah MacLatchy was formally installed as the new president and vice-chancellor of Wilfrid Laurier University on Oct. 27, 2017. She is the seventh person and the second woman to serve in the role since Laurier became a public institution in 1973. Thank you madam chair for those very kind remarks. It’s a little overwhelming to hear your life’s work summarized in such terms. Words are not adequate to express the sense of privilege and responsibility I feel upon being entrusted with this great honour, that of being chosen as president and vice-chancellor of Wilfrid Laurier University. I truly welcome this challenge and I look forward to working with all of you as we lead this wonderful university forward. There are many people who have helped me get to this stage of my life and career. Time does not permit me to acknowledge all of you by name. But I see many of you in the audience — please know that you have my sincere thanks for your support and for being here today. I would like to thank the members of my family for being here today, as well as recognize that my mom and dad were unable to be here because my dad underwent a medical procedure this week with the hope he will be able to attend such celebrations for years to come. Presidential installations are an important symbolic transition in the life of a university. It’s a chance to reflect on our shared aspirations and to check our bearings to see how our current position aligns with our desired course. I was very glad to have the opportunity to speak about Laurier’s momentum at last night’s installation reception. You are graduating from a university that has a strong and growing reputation for the calibre of its programs, the excellence of its teaching, the impact of its research, its focus on the student experience, and its engagement in the community. As university milestones go, however, it is the convocation of our graduates — such as the one we are celebrating here this morning — that are among the most significant. As I look out over the audience, I see graduands, families, friends and supporters. It is my pleasure to welcome all of you here today for this very special occasion. It is a time to celebrate a significant achievement — the earning of a university degree. I am very glad to be with you here today as your accomplishments are formally recognized by the university. A university education is still a relatively uncommon achievement in Canada and around the world. You should be very proud of your achievement. While you, as graduates, deserve much of the credit, you’ve all had support of one kind or another in your educational journey — and I suspect that many of those supporters are in the audience with us today. Welcome. I have a saying on my office door which inspires me every time I enter my office. It is by John Lubbock, a 19th-century biologist, business person and politician, who was among the first scientists to recognize the unifying power of Charles Darwin’s theory of evolution. Universities do more than teach subjects such as those you took during your studies. We have tried very hard to provide you, our graduates, with much, much more than a launch pad for your future studies, careers and vocations. We have hopefully helped you learn how to learn, and more importantly, that you have further developed your own love of learning. It is that love of learning which I hope will continue to buoy you in life, through all your opportunities, as it has me. I’ve been very fortunate in my life that my own love of learning started with my parents. I’ve had school teachers, university professors, research supervisors and peers, colleagues, and most importantly, my students, who have continued to inspire and motivate me in my interest in biology and university administration. I am indeed lucky that the love of learning, and the learning that followed, has actually become my vocation. I know that you will embody Laurier’s institutional proposition — Inspiring lives of leadership and purpose — as have the many Laurier graduates before you. The institutional proposition is authentic to this university, its faculty, staff, students and alumni. It captures both our highest aims and the ethos of the Laurier community. I also know you have received an excellent academic education here at Laurier, one that will serve you well in your future endeavours. I also know that this education extended beyond the classroom and laboratory and that you have challenged yourself and experienced real personal growth. I hope that you are leaving Laurier feeling inspired and confident in your own skills and abilities. 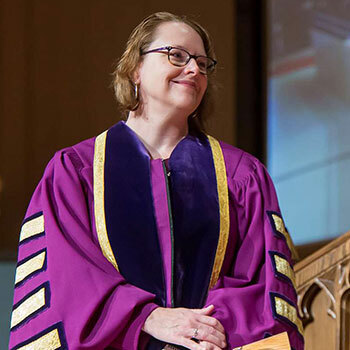 That you will continue to give back to your new communities as you have given to our Laurier community during your time here — and, continue your learning and your leadership in a world that is increasingly complex, ambiguous and challenging. Your years at Laurier have been an investment not only in yourselves as individuals, but also in your peers with whom you have spent this time, as well as in the institution to which you have contributed so much as a student. Not only are you stronger, wiser and more knowledgeable — all because of the hard work that you have put into your learning and personal development — but you leave Laurier a stronger institution because you were here. I hope to do the same during my time here as president. As you move on to the next chapter in your life, I wish you every happiness and success. You will always be an important part of the Laurier community.